The Ghost Town Kayakoy village in Turkey stretches along the hillside not far from the ruins of Lycian city Karmylassos in 7 km from Fethiye. 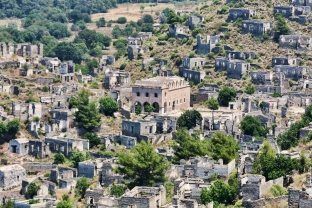 So what is Ghost Town Kayakoy history? In the XVIII century Greeks arrived here from Dodecanese Islands and founded a town here , it’s name was Levissi. In this quite a large town with about 3,500 homes the Greeks lived for centuries. In 1923 when the city had about 6,000 Greeks the “population exchange” was started between Greece and Turkey the Greeks were forced to leave the town. Kaykoy Ghost Town was recognized as one of the World TOP 10 Ghost Towns according to National Geographic – a world leader in geography, cartography and exploration. After the departure of the Greeks the Levissi city was renamed in a Kayakoy by name of a nearby valley – Kaya Cukuru (pothole from Turkish) and vacant houses were populated with Muslims that came from Macedonia. However the Macedonians did not like Kayakoy Turkey and they left the village – Kayakoy village became the largest abandoned settlement of Asia Minor and it is called Kayakoy Ghost Town or Kayakoy Village. Not so long ago the project of reconstruction of Kayakoy near Fethiye was developed by the Association of Turkish Travel Agencies, the Association of Turkish – Greek Friendship and the Turkish Chamber of Architects. According to this project all the houses, chapel, school, library, hospital, shops and some other facilities will be restored. In the churches of the Kayakoy village that are decorated with stone carvings and artificial marble reliefs and frescoes the service is scheduled to be resumed. As a result Kayakoy Turkey is supposed to be a symbol of peace and friendship between Turkey and Greece. You could see the remains of Kayakoy in the movie “Water Diviner” of Russell Crowe. It was filmed there and it was recognized as best Australian movie of 2014 as well as it was named the highest grossing Australian film of 2014. This entry was posted on March 4, 2016 by Martin.